Despite being a lifelong fitness and nutrition enthusiast, a top professional, teacher, personal coach and a unique voice in the health & fitness industry – I personally battled some of the toughest issues most people in society face today. Food and high-calorie beverages became my drug – but I wasn’t even aware of it. In my youth, others called me Porky, pudgy, fat-boy… And having to shop for “Husky” clothes didn’t help matters at all. Through my youth, I could eat sweets, fats and dense carbs with the best of them. Cakes, chocolate, cookies, donuts, ice-cream, muffins, danish, pastries, LOTS of bread and butter, plus LOTS MORE. Going into my teen and late teen years is when I picked up speed on the fitness and bodybuilding path. The working out was natural and fun for me, but the food part was a challenge. In the “off-season” I would eat whatever I wanted and then I would challenge myself on “dieting” down for a bodybuilding competition – getting down to 3% body-fat. It was a grand challenge for sure – but I was able to do it because my desire to compete and win was stronger than my short term desire for rich, heavy foods and high-cal desserts & sweets.. But after the competitions, I would rebound… Severely. The big eater, the food addict in me would show up with a vengeance and within days I’d be packing on the pounds again, catching up on all the foods I deprived myself of in order to compete. I had eaten so much, so fast – right after a competition, that my body couldn’t digest the heavy foods fast enough. I was so abnormally full, it felt like there was food in my throat. I was actually beyond full. I actually did fall asleep a few times, while seated, because I couldn’t lay down… Hoping that my body would digest all the food as I rested. I ended up sleeping into the morning. When I woke up I felt horrible, in so many ways – mentally, physically and emotionally. I learned that food overdose is possible, and it felt crippling. It took me a few days to recover, but I was still eating of course… just not as much. In those few days, I came to the realization I have a problem. And that incident alone was critical. I was starting to awaken to my self-destructive reality. Self-awareness was starting to brew. But I didn’t know what I was going to do about it, yet. And I got on with my life. The next day would come and I would have to live it. Each one. Life took me into my early thirties and by that time JoJo and Alexa, where about 1 and 2 years old, I owned a personal training studio (it actually owned me) that had me working crazy hours, and a marriage that was making life a dysfunctional swirl of pain… a marriage that was on the verge falling off a cliff, every second of the day (and night). It was one of the only places I could derive pleasure. Spending time with my kids and helping my clients reach their goals were the other 2 places I derived pleasure. But food and beverages were a different animal altogether. There were built-in temptations that tested my personal limits and abilities – and I usually lost. The toxic and dysfunctional proceedings for Divorce #1 started and things only got worse. 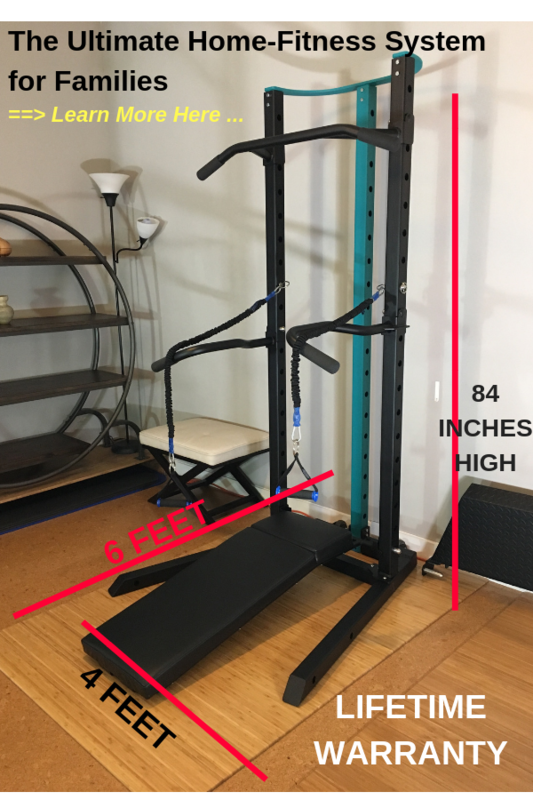 I was technically homeless for over a year, living in my personal training studio, using the massage room as my bedroom… the massage table as my bed. As you might imagine, during that time – food was my ultimate drug. I kept surviving. Eventually going into a new relationship which led to marriage. One that would also end in a painful, but very helpful divorce. The situations and dysfunctions of marriage #2 still fueled my self-destructive eating and drinking habits – but it also started the strongest period of introspection, self-reflection and heightened self-awareness. I began to grasp what was going on inside me AND OUTSIDE OF ME. And this revelation would eventually turn into the foundation of me disconnecting from food and then being able to redefine what food and beverages meant to me, and my life – and then reframe their position and purpose in my life. But my exercise habits were scattered, at best, and I continued to spiral downward for a few years – still unable to put all the pieces together properly. 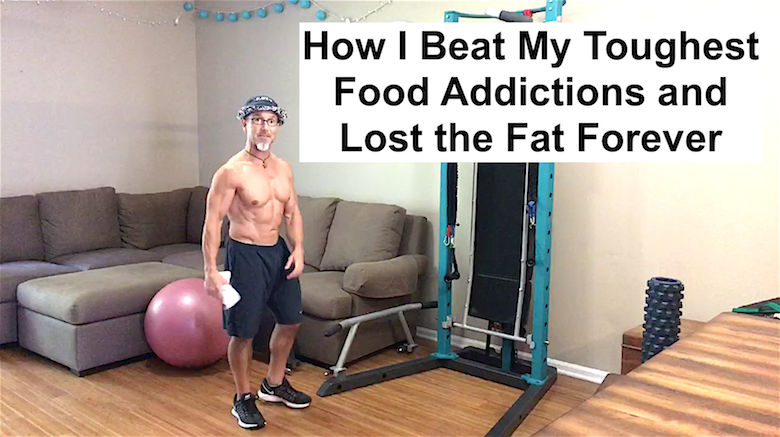 I just couldn’t beat the food demons and get to a place where my “adult fitness habits” were a natural and sacred part of my life. I got to a point where I felt horrible, frustrated, so embarrassed about my state of being… And my medical stats and health vitals were getting worse each year. Cholesterol was climbing – and the ratios were getting worse. Blood pressure was high. This was not a good sign. How could I be someone who guided people to optimum health and fitness when I couldn’t personally do it myself??? I knew the right approach to nutrition and how to match it to an individual’s needs, on their timeline. I had 2 degrees in Exercise Physiology and an intuitive element in me that gave me the tools to help just about anyone who came into my world. But I couldn’t help myself. I HAD TO CHANGE THAT. I had to fix that. I wanted to help more people by LEADING BY EXAMPLE… The Right Example. All of the above required me to become my best… to stop all the self-destructive behaviors that were killing my life – and place highest priority on my health and well-being. And I knew, all the above required that I start taking proper care of myself, because only when we are in good health and living in strength can we be our best and give the world our very best. I needed to use food for what it was intended and not use it as a drug. I needed to find a way to make fitness training realistic and doable – so I could fit it into a busy adult schedule and make it sustainable for life. And I needed to redefine how alcohol fit into my life – and redefine the purpose it would serve, if any. And that’s when things get easier… much easier. I knew just getting to a place where my highest priorities and values guided my thoughts and decisions – I knew I would win. And I knew that would strengthen how I coached and guided others down the same path of success with the ‘self’. This wasn’t about adhering to dogmatic regimens and complex methodologies – but rather it was so much more about simplification, flexibility and getting in tune with the truths of my life and my physiology. It wouldn’t be about “counting macros and micros” or “periodization” or “eating for my blood type” or “working out in the red zone”… NONE of that…. I started applying things I already KNEW TO BE TRUE – and connected those things to my personal values and goals in life. 4 – I decided NOT to let other people or companies decide what foods and drinks will go into my body. (this is HUGE). And I let all my actions be in line with where I wanted to go in life and the levels of health I wanted to reach and live in. If I can do it – then anyone can do it. Yes, even YOU. If you’re struggling in your own, unique way – then I’d like to be the one who helps you turn it all around – just like I did myself and how I help others do the same. If today’s story resonated with you… FIRST – please use the ‘Share’ buttons below to share it with other who may need some inspiration and hope. And if you’re reading this right now and thinking “this is exactly what I need” – then go here, send me a message and let’s set a time to talk in the next few days. Or you can post a message in the comment box below. You’re still reading this because you know you most likely need the help. And I can help you in ways that will change your life in ways you can’t even see right now. Fill in the private form on this page and tell me a little bit about yourself, where you live (Country/State) and the best phone number I might reach you on in the next few days. My coaching schedule is often tight, but every few months a new spot opens up. That spot in my schedule could be the thing that helps you, that saves you – and frees you. Hi Dennis- here’s the thing. You have self-awareness. You posted what you posted because you know you are stopping yourself. Now, the key is to move past that – and start taking one step at a time toward WHAT YOU DO WANT. This was a great read, very open and honest. I’m the same as Dennis, self aware, keep intending to start but for some reason something stops me each time. I’ve noticed I’m like that with my hobbies also. I want to get back to them, I want to change my lifestyle so I have more time for them, but I just don’t go through with it due to “some reason”/no reason. Then I beat myself up over it. Logically it makes no sense how we get ourselves in these cycles. This is one of the biggest traps of our human nature. We get “Distracted” so easily from our priorities and goals, especially when they require some effort and dedication. Some people can tackle those issues without outside help – others need a coach to guide them through the process of becoming self-sufficient, while making progress toward personal goals. Yes please… awaiting part 2! It feels like me too, especially after having a baby. Wow…how I soooo resonate with this honest blog and the comments from Dennis and Andria! “know so well what to do”, yet don’t do it; instead, rationalize…then, “beat myself up for not doing it”; repeat, ad infinitum! what can I say? how does one get out of this cycle? my one simple question–how can one rapidly learn and start taking responsibility for self, and ACTION??? Norahhhhhhhhhh!! Thanks for sharing your thoughts and your struggles! Or we can take the longer route and get proper assistance… which is what most people need…. I was faithfully executing your plan ( diet and exercise) until disaster… I fell on the ice in February and severely strained both MCLs. No exercise allowed until I healed enough to be stable on my feet. Surgery is not yet necessary but I have fallen back so much. The weight gain and loss of fitness has thrown me into a terrible state. I must overcome my physical limitations as well as the depression that has resulted. This has impacted every aspect of my life…work, relationships, and my belief in myself. I hope to get back to somecsembkance of myself …70 lbs lighter. Hi Amy – I’m SO SORRY to hear this. You are in my thoughts and prayers. When are you able to start taking ‘small steps’ toward exercise/fitness??? Are you still in physical therapy, etc.. Which of my programs were you following? I am happy in my life except for the fact that I’m adding on pounds… holiday fun! Anyway, reading about different types of fasting and how good it can be. I am dealing with 3+ years of Plantar fasciitis and inflammation in various joints. Ankles and wrists. Makes some excersises difficult. Still head to the Y each day of the week. Seeing Drs. Trying to eat smaller and healthier. Still love some alcohol in there. Hi Amy! thanks for posting. I’m a fan of the ‘fasting’ concept. That said – we used to do it 30 years ago, when we needed to drop body-fat for competitions – and it didn’t have a fancy name 🙂 It was just something that worked, was easy to do, and was actually healthy. Today, there are these variations, and other things being “sold” with it that make it dangerous. The key is for each person to have some guidance in learning how to approach making fasting a part of their health/fitness/nutrition plans. When I coach a private client – we normally don’t start right off with it and sometimes a client never needs it. So it’s a matter of individual needs, and timing, as well.